There’s something really special about Spanish food. It’s not just the type of food, but also the style in which they present it, the sacredness of the meal time socializing, and the pride behind its roots. This has produced, over time, some really great dishes. While fine dining meals do exist in Spain, they are reserved for special occasions. Tapas and Pinchos (typically food served on a stick) are the most common way Spaniards eat. Translated as “small plates” these dishes are meant to be eaten a few at a time, and shared among others at your table. Many times they are finger type foods, for example a croquette or olives that you can easily eat. Others require taking a portion on your plate, like patatas bravas (potatoes with red sauce on top). 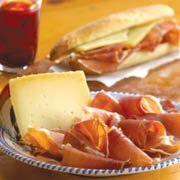 If you are traveling to Spain, do not expect big, full meals. To experience the culture you must have tapas, which are available at most restaurants. If you go to a very touristy place, they will cater towards a bigger tourist meal. Try to stay away from this and eat as they do.Just because they are small plates, does not mean you don’t get enough food or won’t be full. It is customary to order a few, and if you are hungry for more, just order additional tapas…no problem. 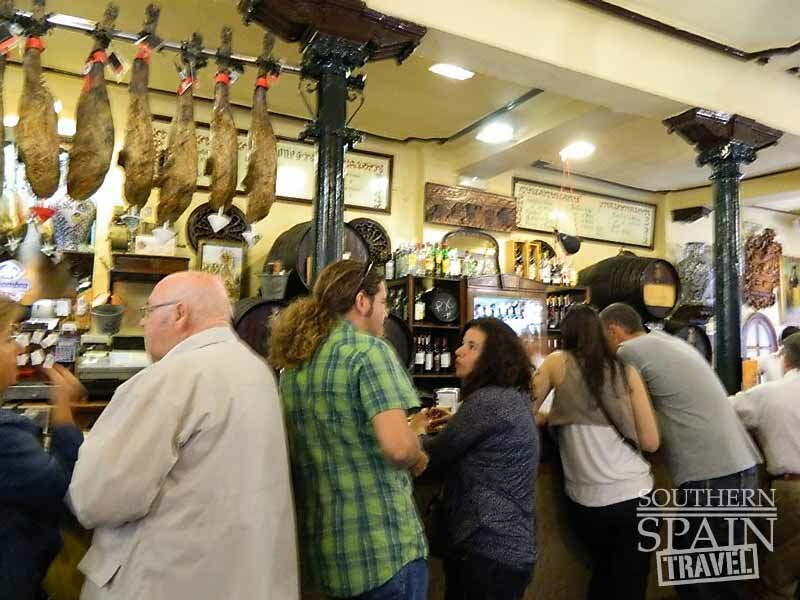 While eating in Spain you'll notice a lot of establishments have counter space only for eating. Don't let this deter you from stopping there. Some of our greatest meals were eaten at the counter with a nice on-tap beer. Tapas are the common food eaten by Spaniards. Order a few, share with your group, and order more later if you’d like. Waiters can take their time. You’ll need to ask for your check when you are ready. Do not aggravate them or you might be embarrassed. Tipping is not big while eating out in Spain. A typical tip is about 5% of the total bill. Fine dining restaurants are around, however, they are considerably more money then tapas restaurants. Many display menus outside of the establishments. You can find many ethnic restaurants in many of the more populated cities.The most common time to eat is during the siestas, from about 2-5 o’clock. You’ll see everyone else eating then too. Many restaurants automatically serve olives or picos (tiny round crackers) before their meal. In most cases, if you eat them, you will have to pay. They seem free but are not. If you are not interested, simply tell your waiter or do not eat it. In the more touristy areas there are many establishments that have waiters standing outside trying to convince you into coming to their restaurant. Just be prepared for that…and don’t cave if you aren’t interested. Sometimes they catch you off guard. 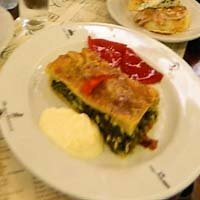 Typical food includes Jamon (pork, ham), gazpacho(chilled tomato soup), tortilla espanola (omelet with potato and onions), baked eggs, rice dishes like paella, fried fish and olives. Tapas made with meat and vegetables are common. Take a look at the most common regional dishes here. Want to see a list of the flavors of Andalucía and a glance at a typical tapa menu? 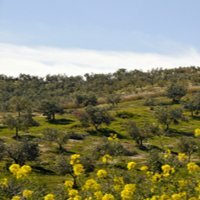 What if you’re a vegetarian? No fear. Vanessa happens to be a vegetarian and she has found countless favorites on the menu. 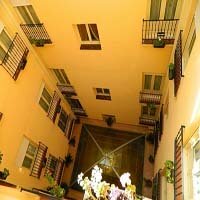 We also have found that there are a good amount of vegetarian and vegan restaurants, especially in Seville. Try foods like olives, toast with tomato, patatas bravas, and lettuce (called lechuga) salads usually with tomato, onions, olives and olive oil. When I’m unsure of what to get when eating in Spain, I like to pair a bowl of gazpacho and then try a new tapa! When you’re there you’ll see other people’s food and just knowing what is anticipated on the menus will help quite a bit. Many of Spain’s larger dishes are larger versions of these tapas, or have a similar spin.